Jean Paul Gaultier (left) and Kent Monkman (right) as his alter-ego, Miss Chief Eagle Testicle, in "Another Feather in her Bonnet", the symbolic union and performance art piece that took place at the MMFA, Friday September 8th, 2017. Photo Credit: MMFA / Frédéric Faddoul. 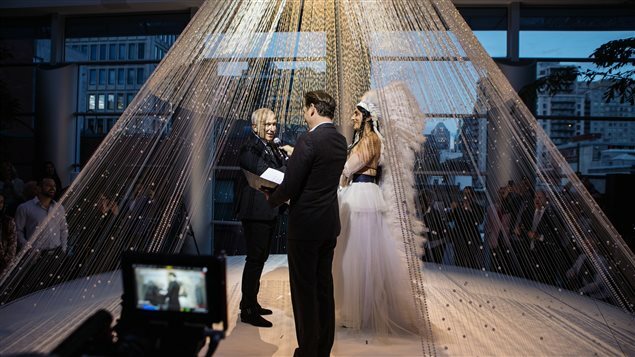 Jean Paul Gaultier and Kent Monkman tied the knot, figuratively speaking, at an event at Montreal’s Museum of Fine Art on Friday evening. Mme Bondil has had an association and friendship with both artists for several years now. Kent Monkman she first me in 2004. Since then, the MMFA has created the largest collection of Kent Monkman’s work in the world. And Jean Paul Gaultier, the designer of haute couture, she met in 2009 when she began putting a show together with him. “The Fashion World of Jean Paul Gaultier: From the Sidewalk to the Catwalk” completed a five-year tour which included 12 cities beginning in Montreal. The exhibit went on to very successful stays in Dallas, San Francisco, Madrid, Rotterdam, Stockholm, New York, London, Melbourne, Paris, Munich and Seoul. The two artists however, had never met each other. “It’s like they would have known each other before they really physically met because they share so much about their values.” Bondil says. “Love is Love: Wedding Bliss For All a la Jean Paul Gaultier” is currently at the MMFA. The surprise performance piece took place at a fundraising gala with patrons of the Angel Circle, a group that fund raises money for the MMFA with under privileged families in mind. It was recorded and Kent Monkman will create an installation, including the crystal teepee that contained the spectacle, around it. When completed, it will have its home at the Montreal Museum of Fine Arts. Now, particularly in Canada, in the wake of the Truth and Reconciliation Commission, and this year’s celebration of Canada’s 150th anniversary of Confederation, when many native people object to the festivities as their ancestors and culture thrived for millenia before, the understanding of cultural appropriation, and what native people hold sacred, is a debate in which many Canadians are engaged. There is a much greater awareness of our history and the dark chapters it holds in regards to the treatment of our First Nations. Kent Monkman has captured several aspects of the ignorant and violent treatment of native people in Canada in his paintings. To have Kent Monkman, in his alter-ego, known as Chief Eagle Testicle, wearing the head dress in the wedding experience Friday evening, could be seen as the opportunity for Monkman, a Metis of part Cree, part Anglo-Irish ancestry, to re-appropriate the head dress. “The head dress, with the robe, also belongs to the Art Gallery of Victoria, in Melburne, Austalia, where it has been bought by the director, who is also married with an aboriginal, indigenous man, it’s also a statement for them in Australia.” Bondil explains. “Beyond the controversy, beyond the issues, beyond divisions, great artists dialogue together, and they create kind-of artistic islands, an aesthetic union in order to fight together for the same great values they want to defend; and this is really the sense of this performance.” Bondil says. “It was touching, it was moving, but it was also joyful” is how patrons, having witnessed the event, described it to Nathalie Bondil. “Through marriage, we learn to better understand and to forgive the shortcomings of our spouses and to establish a genuine knowledge of the other. Marriage stimulates and nurtures new life and new experiences. Today, Miss Chief accept the offer of artistic union of Jean Paul Gaultier as an aesthetic alliance under the sign of mutual respect and intercultural recognition, ” Kent Monkman said during the performance. As for Jean Paul Gaultier, he said, “I am delighted to return to Montreal, the Montreal Museum of Fine Arts, where, in 2011, our wonderful adventure began. It’s a real honor to participate in the creation of Kent Monkman, a remarkable artist engaged in an open dialogue and to present for the first time in my finest couture wedding creations Museum … for all!